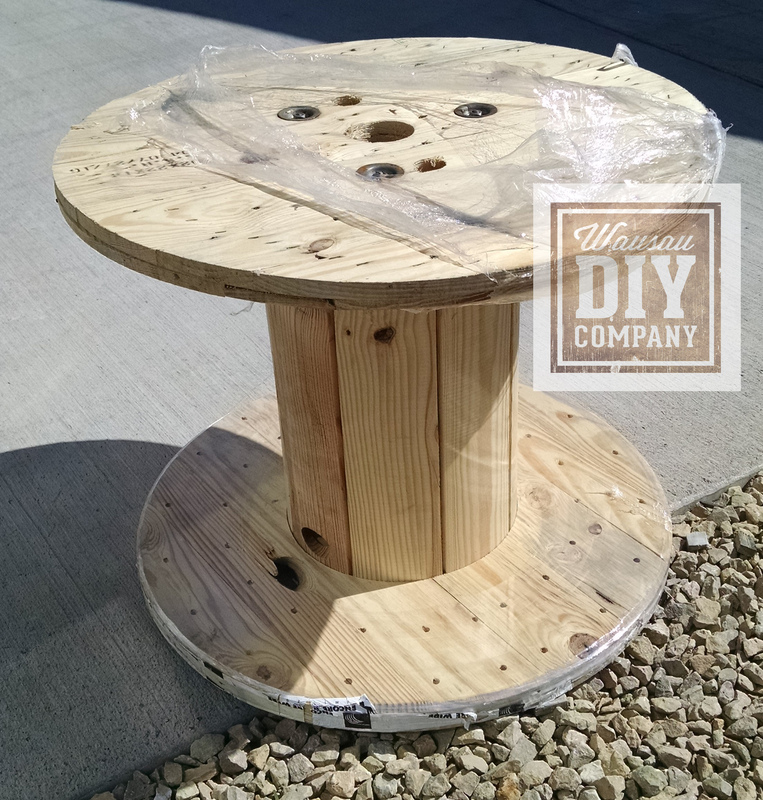 On our endless search for pallets, we stumbled across one of these spools. (After we asked for permission of course..), it was loaded into the truck. We weren’t sure what we were going to make with it, but it was going to be something neat! 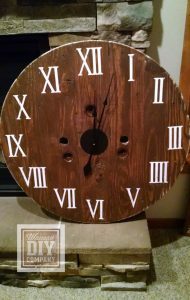 We searched Pinterest for awhile and found some ideas for spool wall clocks. Here’s a brief tutorial on how to make your own! Check us out on WSAW at 5:00 pm on Wednesday October 12th for a demonstration of how simple it is to create. Elbow grease….a lot of it! 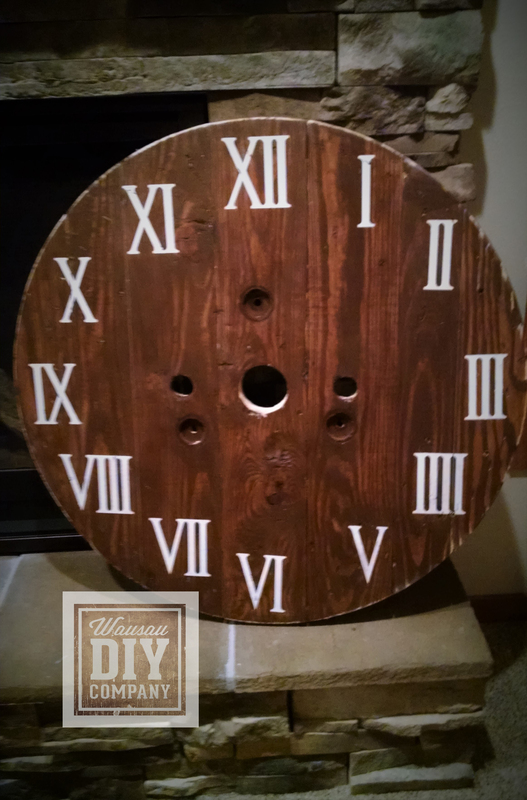 Stencils for the clock face; you can use standard numbers, Roman numeral or even dots/dashes. Most craft stores sell number stencils or you can contact us to make you some vinyl stencils. 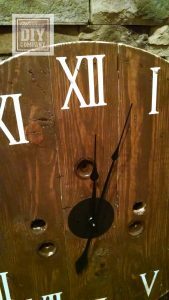 Clock hardware; based on the diameter of your spool you may need to adjust your hand length. 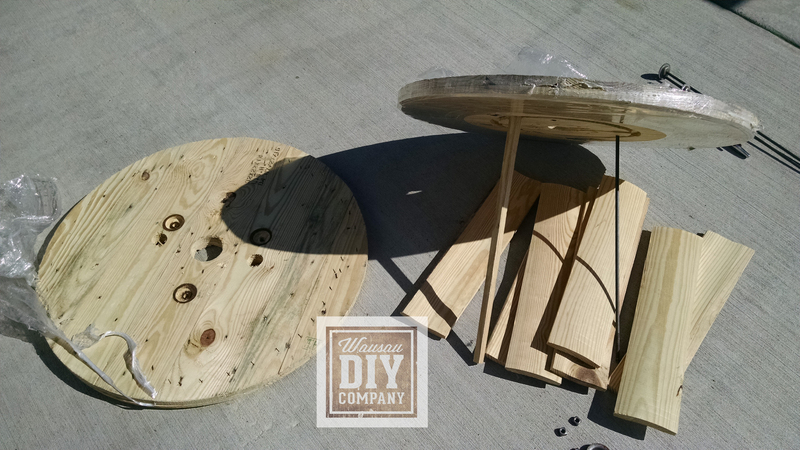 Our spool is 32″ in diameter so we are using 12″ hardware but 14″ would work nice also. Once you obtain your wooden spool. You will need to disassemble it. You can use two adjustable wrenches or one adjustable wrench and an impact wrench. You may need a helper for this step depending on the size of the spool and the length of your arms. You will need to sand the spool smooth using sand paper. Ideally you using a power sander (either orbital, palm or belt sander) will make the task easier. You will want to sand with 60 grit sand paper first and do a finish sanding with 100 or higher grit. This will be difficult to sand by hand but possible….more power is better for this step! 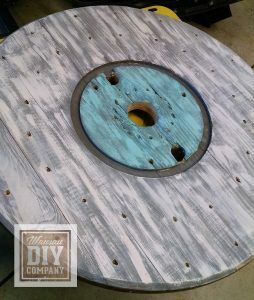 Stain or paint the spool. There are unlimited options as to how these can be finished! Ours is stained on one side, and painted on the other. 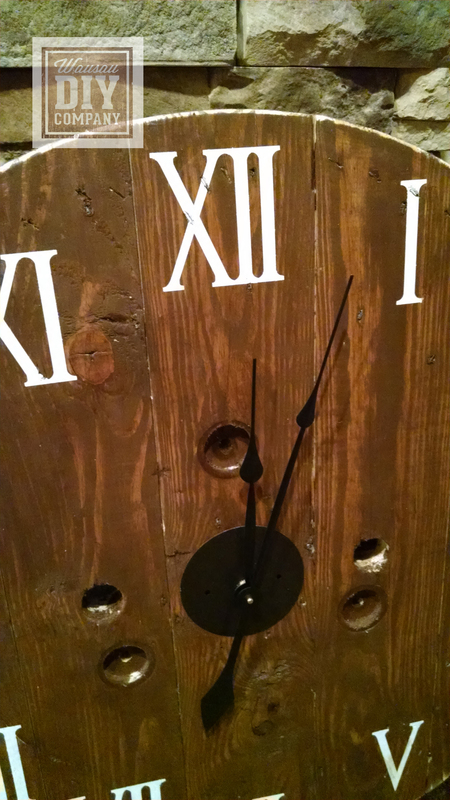 Paint numbers or symbols on the clock face. 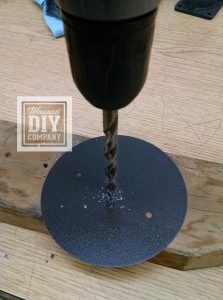 This easiest if you use stencils. This may take some searching. 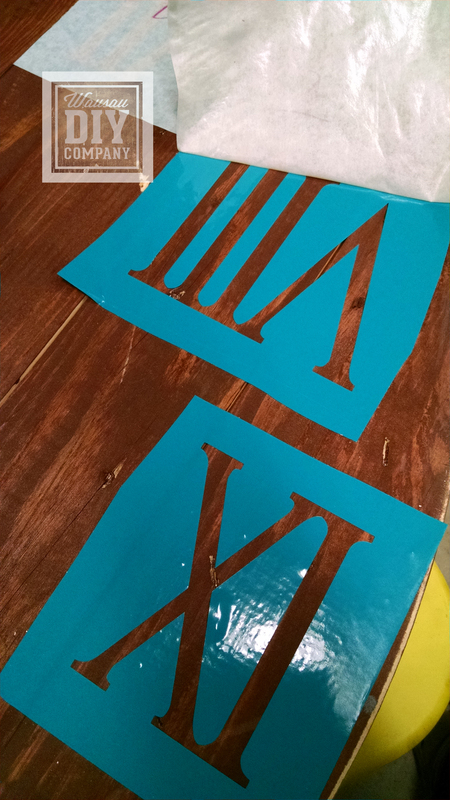 (Basic fonts with numbers can be found at craft stores..) We dab lightly with paint (2 coats). Another option: You could use dots or dashes instead of numbers! After painting ours, we sanded with a fine grit sandpaper to distress slightly. Attach clock hardware to circle (from Step 5), following package directions. Some brands may be different. 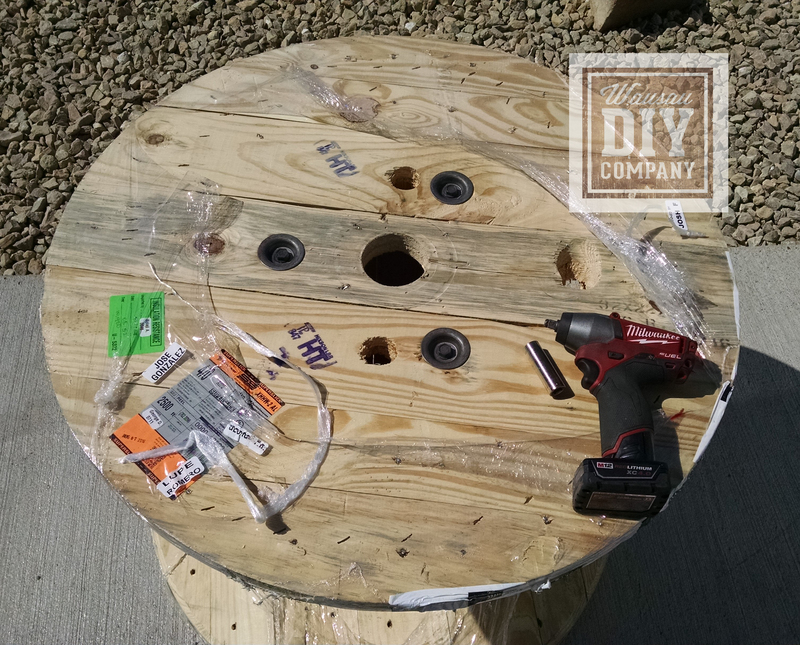 You will need to attach the circle to the spool end/clock, and for that we will use two #8 sheet metal screws. 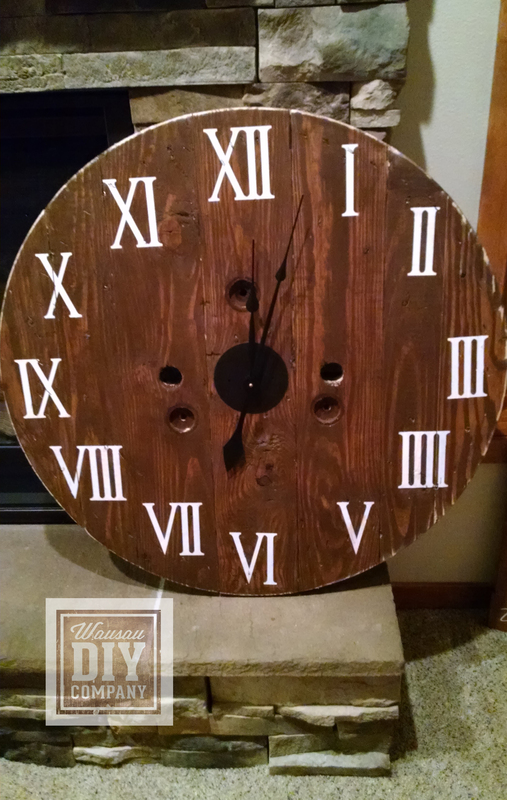 Install a battery, set your time, and you are ready to display your creation! Another option would be using heavy duty framing hardware. Use drywall wall anchors or directly to studs for attaching the hardware to your wall. 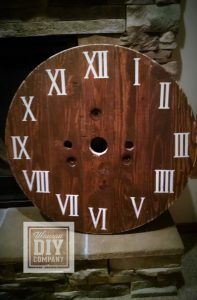 Bonus, you’ll have one extra spool end to make another clock! Christmas is coming, this would make a great gift! We hope to have a workshop in December to make these. Let us know if you’d like to be added to our contact list for when we launch this workshop! Keep on DIY’ng and let us know if you have any questions!